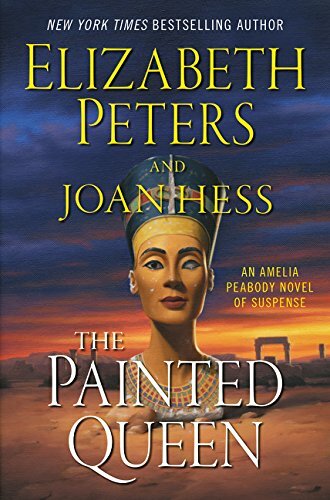 Amelia Peabody and husband Emerson, whom she considers the greatest Egyptologist of the 19th century, have returned to Egypt where things immediately start with a bang . . . or rather a thud, as a man barges into Amelia’s suite and immediately drops dead. “Touching one hand to his throat, he gasped, ‘Murder!’ and collapsed onto the floor. The man has no identification, other than a monocle and two cards in his pocket with the names “Judas” and “Octavius Buddle” written on them. Leaving the problem in Russell’s capable hands, Amelia and Emerson continue to their destination, Tell-el-Amarna, where Akhenaton, the so-called Heretical Pharaoh, reigned. The German archaeologist running the dig is absent, and Emerson has been asked to take over until he returns. Meeting them there are Ramses, Amelia, Emerson’s son, and his friend, David. The arrival of foster daughter Nefret, brings an answer. In a struggle with Nefret’s villainous husband, Geoffrey, Ramses accidentally killed him. All affect monocles, and all have sworn revenge for their brother’s death. Two have now been foiled, so only three threats remain. Electing to go with their assigned project, Amelia and Emerson discover Herr Morgenstern is a man well-admired in his field, though since arriving at Amarna he has shown erratic behavior, disappeared for days, then returned with no memory of where he’s been. At the dig, Emerson discovers a bust of Nefertiti, Akhenaton’s queen. Soon after it’s stolen. Between hunting the statue and the forgeries made of it, foiling other assassination attempts, and keeping up with Morgenstern’s many disappearances, Amelia will once again confront master criminal Sethos. Possessing an unrequited attraction to her, Sethos is as intent on keeping Amelia safe as he is in finding the bust for his own purposes. In the company of a romance novelist, and a missionary with a penchant for drink, Amelia and her group will lead both the criminals as well as their readers on a merry chase before the final villain is felled and the priceless Nefertiti restored. Elizabeth Peters, pseudonym of Barbara Mertz, has always shown expertise in mixing archaeological history with the adventure of a murder mystery. The Painted Queen reveals how well she handled that task. Amerlia Peabody has been called a mixture of “Indiana Jones, Sherlock Holmes, and Miss Marple.” Though Emerson may not qualify as Dr. Watson, or Ramses, David, and Nofret as the Baker Street Irregulars, her mysteries carry that same late-Victorian ambience. Only partially written before her untimely demised in 2013, The Painted Queen, with a Foreword by Salima Ikram, professor in Egyptology at American University in Cairo, a Preface by Joan Hess, and Introduction by the Trustees of the Barbara Mertz Trust, is both a tribute to a gifted writer and a well-done finish to a thoroughly enjoyable series. Based on the actual events surrounding discovery of the Nefertiti bust, its disappearance and recovery, the novel is both a mystery, a rollicking adventure, and a short course in a specific era in Egypt’s past. Though called the final adventure for Amelia Peabody and company, Joan Hess’ style so closely resembles Peters’ own that the reader won’t be able to distinguish where one ends and the other begins. Should the trustees of the Barbara Mertz Trust concur, it’s conceivable Hess could take up the reins and continue the series.